Blink your eyes (on this crazy short hike) and you’ll have already arrived in paradise! The gushing waterfall and turquoise blue pools on Fossil Creek’s Waterfall Trail are truly feasts for the senses. And frolicking in these deliciously refreshing waters, after such little hiking (although there is a lot of driving), is almost junk-food-like in its nearly instant gratification – kinda’ like being given the tastiest potato chips after just getting up from the couch. Similarly, it’s a hike that is really hard to resist! And why should you? One you’ve savored this amazing location, you’ll end up returning again and again. Although the Fossil Creek Waterfall Trail itself is short, the trailhead (located in the Coconino National Forest) does require a quite-vibrating, 15-mile drive, on an unpaved road, to reach. A high clearance vehicle is a must. This one-hour drive crosses through beautiful back-country hills and valleys. The trailhead is located just past a gate officially blocking Fossil Creek Road from ongoing traffic (due to a past landslide that dissected the route to Strawberry). A number of rudimentary parking areas are situated along the hilly, last half-mile of the open road. During hot Summer months especially, these lots can get full. Beyond this gate, arrows (attached to a fence along the roadway) point to the trail. At a fence opening, the trail starts its easy descent down a short hill, and begins approaching Fossil Creek. The sound of rushing water gets louder – although the stream doesn’t come into view for a bit. Curving right, the path slowly advances towards, and along, the creek, crossing small bogs and under the shade of plentiful trees. After a bit the creek, with its many small waterfalls and popular swim holes, begins to peek in and out of view. Finally, the trail opens up onto a flat pebbled area, with numerous large rocks to sit on, and a crystalline view of the 15-foot waterfall, the cave behind it, and the deep, turquoise-blue pool below. Hopefully you brought your swim suit and a lunch. Take a break. 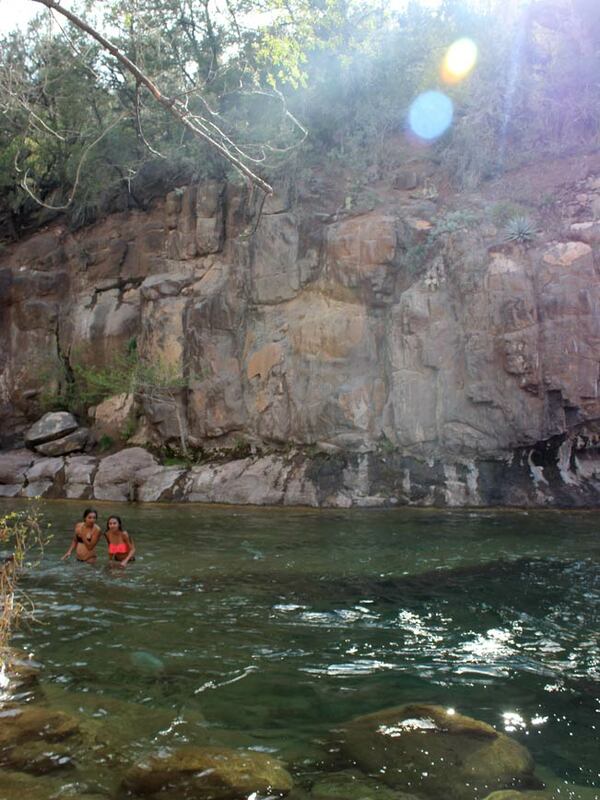 Go for a dip in the chilly waters. And remember to take your trash out with you when you leave. If the waterfall is crowded, awesome dive-worthy swim holes can also to be found behind the cross bridge (located one-mile back on the road), where equally clear, turquoise waters are encased in gorgeous mountain views. 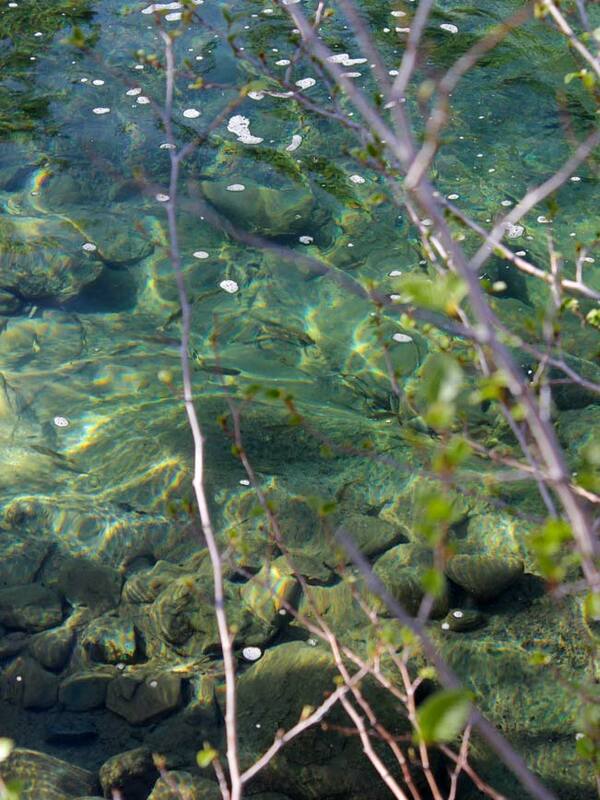 The high calcium content of Fossil creek creates its amazing turquoise tone. This spot receives over 60,000 visitors per year. So anticipate crowds in the Summer. Click here to get a permit, April – October. Click here to see a map of the permitted parking lots. Directions From the intersection of I-17 and AZ-260 (I-17 exit 287) at Camp Verde, take AZ-260 east for 10 miles to West Fossil Creek Road. Turn right on West Fossil Creek Road and continue 15 miles to the trail head parking lot, on the left side of the road. Warning: the main trail head to Fossil Creek, the one most people will direct you to from strawberry, leads to a 4+ mile fairly strenuous hike one way. The way out is all uphill, and all in the sun, so bring several liters of water. I’ve taken several groups there, and we’ve had to assist unprepared hikers who attempt to hike it out with insufficient water. Dogs especially will struggle, and 4+ miles of walking on bare dog feet that have been softened up by swimming can be very painful for them. I usually stay until near sunset, and hike out with a headlamp to make it easier on my old golden retriever. Thank you Roberto. The instructions provided here are from the opposite direction – from Camp Verde. Approached this way, making the 15 mile drive fro the west to the parking area, the hike is just a little over one mile, and very easy. I’ve yet to try the trail from Strawberry. But understand that it is longer and more strenuous. Is there any address for GPS in camp verde or to the parking area? Thinking of going tomorrow. Sorry for the delayed response (was hit with the flu-argh!) If you haven’t already headed out the GPS coordinates are 34°24’18.0″N 111°36’50.3″W. Hope you have a great hike. This one is a beauty. Especially after the Summer crowds have disappeared. A bit confused… We’ve got our permit/parking reserved and are going to FC for the first time in a few weeks. This site says 1.2 mile easy hike to waterfall. I’ve also read elsewhere about a 8-10 mile r/t uphill water-chugging death march to waterfall/spring. Are theses the same?! Is this “waterfall trail” vs. “flume trail”? Thanks for any clarification! Hi Brett, I can see why this would be confusing!! 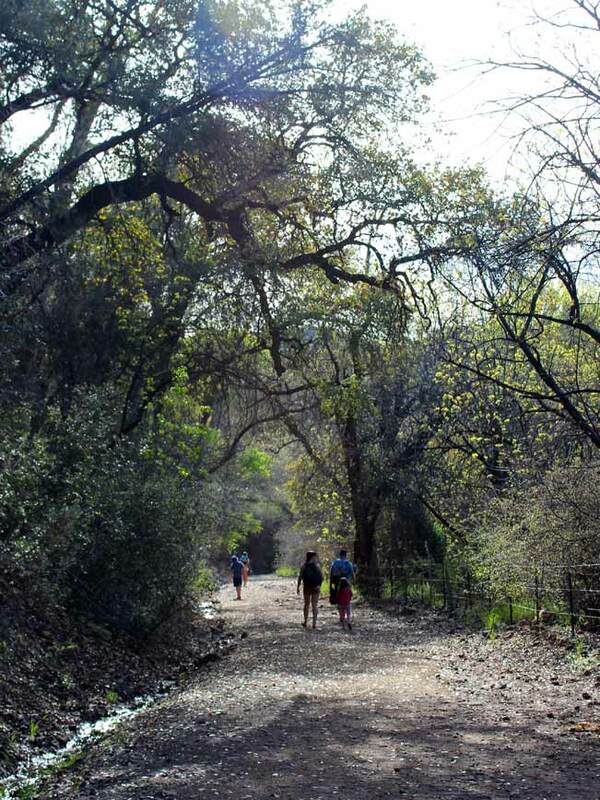 Please note that there are three separate hiking trails that access different portions of Fossil Creek: the Waterfall Trail (described here), is the most popular due to its ease, short 1.2-mile length and access to the Creek’s popular waterfall. 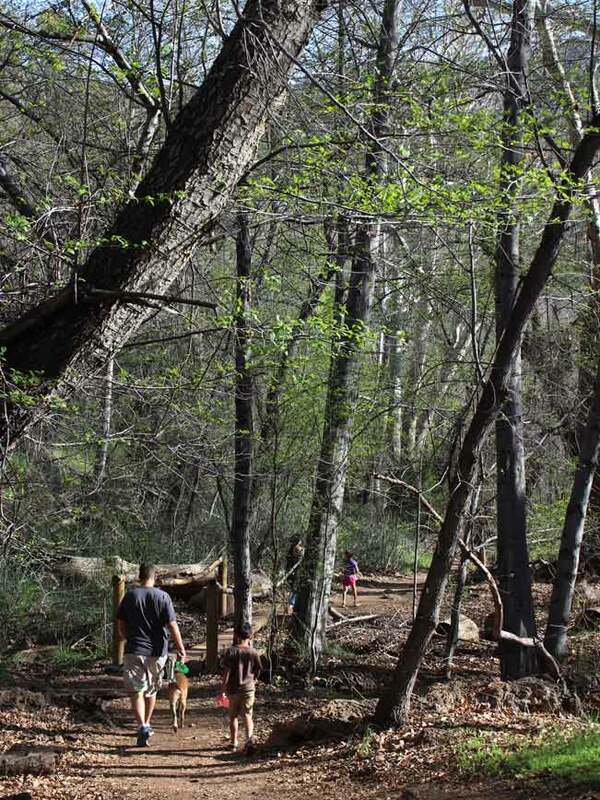 The two other trails are the five-mile Flume Trail (that has limited creek access) and the more strenuous, 4.5 mile long Fossil Springs Trail that departs out of Strawberry and accesses the Creek’s springs. From April-October, the Forest Service is requiring a permit to park at one of nine parking lots located either near the Creek itself, or by one of these three trails (see map). It is important to note what lot your permit is for. The Waterfall Trail Parking Lot and Irving/Flume Trail Parking Lot both provide easy access to the Waterfall Hike (described here). 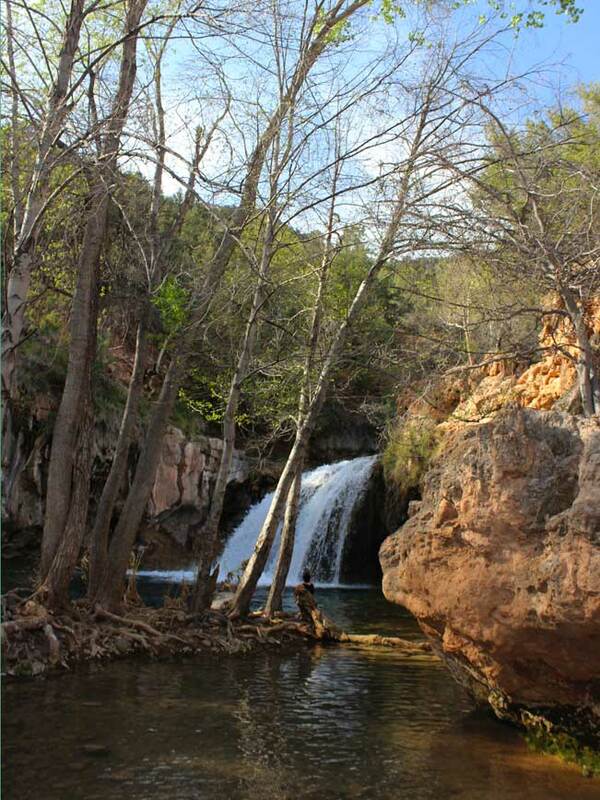 The Tonto Beach, Fossil Creek Bridge, Homestead, Sally May, Purple Mountain and Mazatzal Parking Lots all provide good access to swimming at Fossil Creek itself – but become progressively farther from the Waterfall Hike (with Mazatzal being almost 7-miles away). All of these eight parking lots are located on the west side of the Fossil Creek Wilderness Area and are accessed from Camp Verde. The ninth, Fossil Springs Trailhead Parking Lot, is the only one located in Strawberry. It provides access to the more challenging, 4.5 mile Fossil Springs Hiking Trail that you note above (although I wouldn’t call it a death march :)). I hope this helps. The map at the link above helps clarify as well. Hope you have a great time! The creek is beautiful and refreshing no matter where you access it. are these round trip miles? Hi Alysha. The Waterfall Trail at Fossil Creek is mostly flat, with a few very minor hills. The 1.2 mile distance given above is one way. As noted by some of the other people, if you hike in from Strawberry, on the Fossil Springs Trail, there is a lot of uphill. What kind of car did you take to the waterfall trailhead? I have a large SUV, not 4wd or anything, but a big SUV. Do you think this will work? I took my Prius :). The trailhead is located 15 miles along Fossil Creek Road. This is a well maintained, graveled, Forest Road, prone to getting a “washboard” texture. So expect to drive slowly and feel consistent vibrations on the drive in. The last 1-2 miles are a bit more eroded, with some holes and exposed rock. Definetely passable in an SUV. If you want to go to the waterfall, the hike from the Homestead Parking lot would be 3.1 miles each way (2.1 miles further on Fossil Creek Road, and then 1 mile on the Waterfall Trail). However, you can access the creek itself just a little ways from this parking lot (see downloadable map above) to swim. There is also nice swimming at the Tonto Bridge, which is only 0.75 miles further along Fossil Creek Road from the Homestead Parking Lot. Does the waterfall trail connect to the spring trail at some point? On the map it does not appear to but I thought I would ask anyways! No, it doesn’t. The Waterfall Trail stops at the waterfall, while the Fossil Springs trail ends at a spring a few miles further upstream. do you have to book a parking permit or can I pay when I get there? 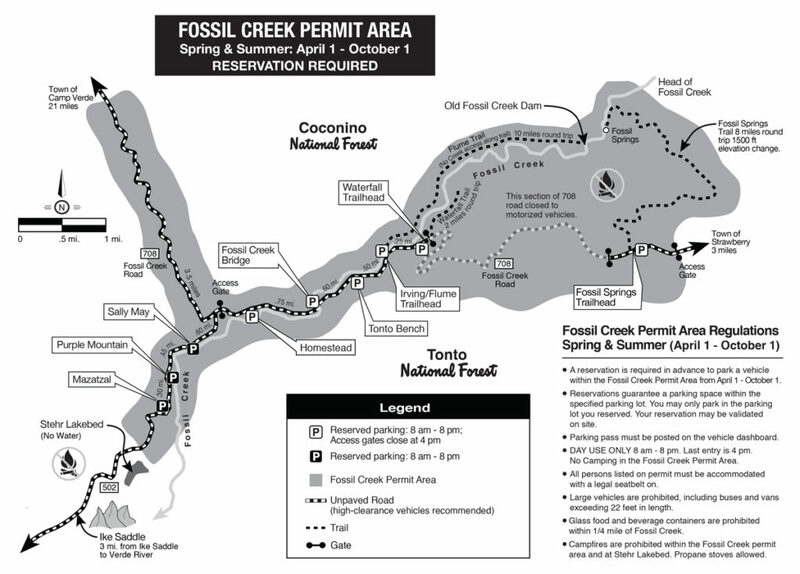 April 1 through October 1, you need to purchase a permit before you can park at Fossil Creek. You can do this online at https://www.recreation.gov/wildernessAreaDetails.do?page=detail&contractCode=NRSO&parkId=74997. Without a permit you will not be allowed to park. All of the parking permits are sold out and the closest one to the waterfall trail is the Tonto Bench Parking Lot. Is it easy to get to the waterfall trail from the parking lot and how much further is it? Also, I have a 2014 Honda Civic; will my car make the 15 mile dirt road? Yes, it is easy to get to the Waterfall Trail from the Tonto Bench Parking Lot. You’ll need to walk an additional mile up the road to reach the trailhead. As for the road, it is well graded, but has a lot of washboarding. Just take it slowly. I Just reserved a parking spot at the Sally May Lot. What can I expect at that lot? I will be traveling with another adults and 6 kids — 5 between the age of 13-16 and one age 6. Will we be pleased at this lot or should we hike to the waterfall and if so, what should we expect on our hike? Hi Abby, Unfortunately I am not familiar with the Sally May Lot area. From the map it looks like you would have easy access to the creek, which should be lovely to play in. If you do decide to hike to the Waterfall it would be about 3 miles each way (mostly on the road). Is the waterfall trail, described here, the same waterfall with “toilet bowl”, or is hat a different area? Hi Jennifer. The waterfall on the Waterfall Trail is different than the so called “Toilet bBowl.” The Waterfall Trail leads from the Waterfall Parking Lot to the popular 15 foot waterfall along Fossil Creek. The “Toilet Bowl” is a rough flowing section of Fossil Creek located off the difficult, 4.5 mile Fossil Creek Hiking Trail, whose trailhead is located in Strawberry, AZ. How high is that waterfall? I jumped off and fractured a vertabrae. I know it’s more than 25 feet! Yikes! So sorry to hear about your back Brigid. That is scary. To answer your question, the waterfall itself is about 15 feet high. But the cliffs beside the fall, that people jump from, are higher (between 20-25 feet high). Jumping is not recommended for everyone. Indeed many people get hurt jumping each year. Take caution in the water right under the fall as well. The fall creates a strong churn that can be difficult to swim out of. I have a reservation at Irving/Flume Trail Parking Lot. I would like to to setup camp but I keep reading that their is no overnight camping allowed. Do you know of any campsites in the area? Hi Kim. You are correct that there is no camping allowed within the Fossil Creek Permit area. The closest campsite that I am aware of is the Childs Dispersed Camping Area. 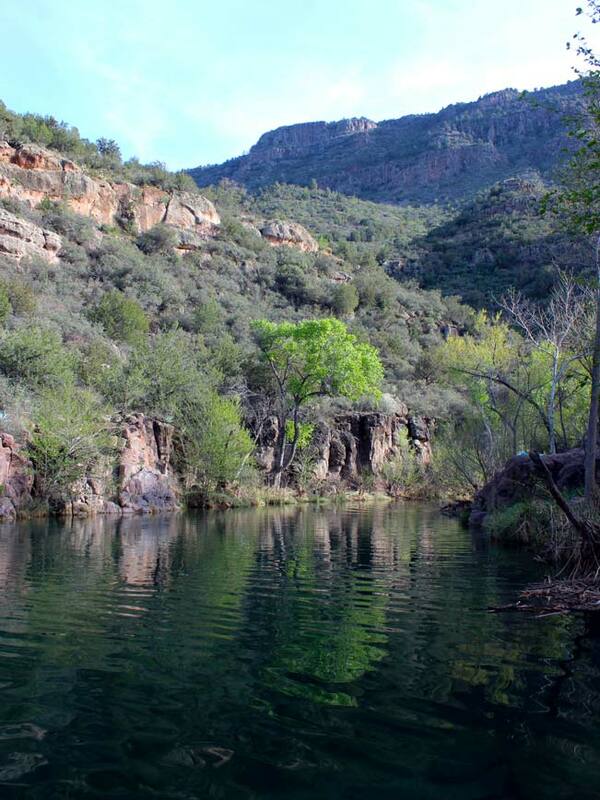 It is in the area, but off of a different road than Fossil Creek Road, and adjacent to the Verde River. I haven’t camped there personally – but hear that it is beautiful. You can find more information here: https://www.fs.usda.gov/recarea/coconino/recarea/?recid=75354. What would be the easiest walk from one of the parking lots to water? My children and I have asthma so I try to make things as easy as possible for us. Love the blog. Thank you. Hi Dawn. So happy you like the website! Each parking lot provides easy access to Fossil Creek, but not necessarily the waterfall, with very little walking required. Mazatzal is a teeny bit further from the creek, but not much. If you want to visit the waterfall itself, you would need to make the 1.2 mile hike (from the Waterfall Parking Lot) or hike a little further (from the other parking lots). Hope this helps. Hi Jessica, Since I haven’t personally done the Fossil Springs Trail (yet!!) I am not able to answer your questions well. From all that I have heard and researched so far, it is a challenging trail with a lot of sun exposure – so it is good that you are prepared. The well publicized “Toilet Bowl” is off of this trail, but I am not sure (yet!!) how close it is to the path. I’ll be sure to add more info. once I hike this one. Or let us know what you find out. Using an ordinary passenger car, what be your estimate as to how long would the 15 mile trip to the Waterfall Trail Head take? Hi Ken, Although this is a well maintained gravel road, it usually has a lot of “washboarding” that makes the going a bit slower. There is also some wear & tear in the road closer to the Waterfall trailhead. You should allow 45 minutes for this part of the trip (althogh it could take a bit less). We tried to get parking for the waterfall trailhead but it is sold out. We were looking for an access point that has deep pools with good swimming and maybe some places to jump in to the water. Do you know anything about the mazatzal parking area? or any other access point that would be good for swimming and jumping points in to the water? Hi Jen, You will have access to the creek and swimming from any of the parking areas. I haven’t been to all of them. But there are deep pools that can be jumped into from the Fossil Creek Bridge area as well. This is actually my favorite spot! The last picture on the post was taken there. Have fun! Hi Christine, You made a good choice getting your permit at the Flume parking lot. This lot is only a quarter mile down the road from the Waterfall parking lot. So it is easy to walk to that lot and to catch the 1-mile Waterfall Trail to the fall. You can also choose to hang out on the creek near the Flume parking lot. This area pretty, but without falls. The Flume Trail itself has very little water access. It climbs a ravine and follows the far side of the creek from above. So, if swimming is your goal I wouldn’t recommend it. Have fun! Thank you so much! this info helps alot 🙂 appreciate it! Question. If I have a permit for lot 2 flume trail, instead of doing the flume trail itself can I just park there and walk to waterfall trailhead?? How long of a hike would that be round trip? Absolutely! You would just need to hike .25 miles further up the road to reach the Waterfall Parking Lot and trailhead. Have fun! Hi Mat, Sorry for the delayed response. Yes. You would have to walk an additional 2.1 miles up the road from the Homestead Parking Lot to reach the Waterfall Trailhead. This section of road is rather hilly, rocky and exposed to the sun. So be prepared if you opt to make the trek. Alternatively you could hang out by the creek closer to the Homestead Lot. Good luck! Is there no where to park besides the parking lots? We really want to go tomorrow, thinking we would beat the crowds, but all the lots are full! A permit is required, and you have to park in the designated lots, from April 1 through October 1. This helps to control the number of people in the area and limit damage to the natural landscape. Better luck next time!